Having been hidden from public sight since the 1950s, the absorbing collection will finally be available for public viewing in a brand new, free exhibition from 1 October until summer 2019. Commissioned by the Bank of England in the 1950s, the works capture post-war life, architecture, design at newly-built printing works at Debden, as well as the creation of a banknote from start to finish - all from Topolski's captivating and atmospheric viewpoint. 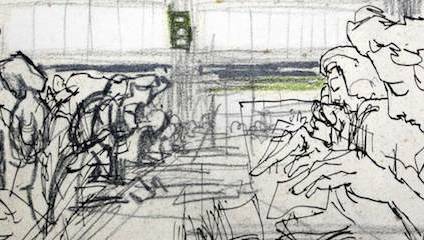 As well as bringing into the light a long-hidden set of Topolski pictures, the exhibition will include photography of Debden since the 1950s and examples of the individual notes under production.